An Encounter with a Baburam Bhattarai Supporter in Delhi | United We Blog! Sujan Lamichhane came to Delhi to work as a peon in a private office three years after finishing his school. He worked as a waiter in a restaurant in Kathmandu for some years before coming here. The man from Gorkha district admitted himself in a college in Delhi while he continued with the job as peon. “Now I earn Indian Rs 26,000,” he said. “Very good salary for me; thank you India.” The 27-year-old seemed to be very happy not to have to go to “Dubai and Malaysia” for job. Many Nepalis who are living and working in India for years or decades have one striking common wish: none of them wants to live in India for their whole life. They praise India for its economic progress, are thankful to the country for hosting and providing employment but somehow, deep inside their heart, they are not satisfied with the life that they have here. They express their displeasure while talking about the state of affairs back home and berate political leaders. But at the end they say their heart is in Nepal and, sooner or later, they will surely return to the homeland. Sujan often frequents between Delhi and Gorkha. Two years ago he went to his village Ghyampeshal (which was in news recently) to campaign for Baburam Bhattarai. He is proud of the fact that Bhattarai received “the largest number of votes in Nepal” to win a seat in the constituent assembly. No pun intended in there, I suppose. Sujan was talking about the rapid development works that are happening in China. Though Prachanda is probably the most recognised Nepali name and face nationally and internationally today (Gyanendra is perhaps his competitor) I have seen his charisma eroding over the past couple of years among Nepalis including the Maoists themselves. Going by what Nepali netizens across political divide have been expressing on Facebook and other web sites in the past several months I have concluded that Baburam Bhattarai is the sole leader in Nepal today who commands faith and carries hope of majority of Nepalis. “Every leader thinks of filling his pocket first,” Sujan said. “No one thinks about the country. Baburam Bhattarai tried to do something [while he was the finance minister.] Is it wrong to impose tax? It’s for the country, not for Bhattarai.” While his party has become shockingly corrupt by directly or indirectly encouraging forced donation, extortion and intimidation, Bhattarai has been hailed as one of the most effective ministers with the cleanest image Nepal has ever seen. Sujan is in no illusion that Nepal can progress without first fixing its politics. But he also feels that development of a country doesn’t solely depend on politicians. Citizens too have their role to play. That is why he has set a deadline to return home. Great and innovative idea of Mr.Sujan for which he is entitled to be thanked.But,there’s still some sort of doubts about doing all those enterprenuiership sinc the looter gangs prepared by so called political parties may approach there to disturb from doing all those deeds.For noble cause of nation and people,Nepal still looking a good dictator like Lee kwan Yee of Singapore,who could install the law and order situation and punish the criminal by ending the state of impunity. Dear writer and reader ! I am not baised about Dr. Baburam Bhattarai. I also know- Dr. Baburam Bhattarai is a honest intelluctual in working. But, it is a matter of grief that he has been taped ( captured) by RAW. You know, being a good man he destroyed his life being the agent of RAW-SD Muni. Who can nectect this truth ? He has been writting agent the identities, unity aof Nepal, including Prithbinarayan Shah who united this greater Nepal. Can Dr, Bhattarai refutation the following blame ? After the Royal Palace Massacre, to diverse the blame to RAW, the Moaist leader Dr. Baburam Bhattarai wrote, according to the hint of P. Harmij (Nepal-Chief of RAW) that the King Gyanendra was responsible to create the Palace massacre, 2001. (Kantipur Nepali daily Nepali- 6th June 2001 (Bs 2058 Jestha 24) it is notable that after Royal Massacre P. Harmij appointed the Chief of RAW in India. Then, the demure start that the Palace massacre was created by King Gyanendra to capture regime. After the Royal Massacre-2001, the so-called People’s movement 2005, which was guided by RAW, was two vital agendas- one Republic and another Secular state. Then, RAW’s the Drama starts to disintegrate unity of the country. It is necessary to quote S. D.Muni (Professor of J. N. U. and the policymaker of south block & the strategist of RAW ) in his article ‘Dealing with a new Nepal’ in ‘The Hindu’ Daily on 15th September 2008 has conceded that India had provided one billion rupees for running the agitation. ‘With those resources along with the guidelines of south-block, they could forge the mass movement. Recently (29 Jun 2009, The Kathmandu Post), then Indian foreign minister Pranab Mukharjee accepted that the Maoist party which was an extremist party and chose violence, was convinced by India and compelled to join mainstream politics. According to him, they also convinced other mainstream political parties (Nepali Congress, UML) to form government by including Maoist party also. Till then Maoist was protected and armed by Indians. Within a month of the conclusion of the people’s uprising on 19 May, 2005, Jug Suraiya (columnist) of ‘The Times of India’ (a newspaper run by RAW) had described, “India and China must divide and share Nepal as it has now become a failed state”. The culprit leaders (Congress, UML & Maoist) remained silent against the concerning game of the RAW strategy. Than, how we can support him ? I think, everybody is interested to know the current political drama in Nepal where the traitors are fighting for the post of Prime Minster. Due to the culprit political elements, the Nepalese nationality, royal institution and democracy is wounded, sovereignty is in peril. They took a decision to draft the constitution within two years by staging a drama of Constituent Assembly (CA). They are set to deceive the people by extending the CA term acting upon their wish after failing to draft the new constitution in the two year period. All three of the so called big three parties are attempting to impose an autocratic regime on Nepal. To extend the time of the CA is unconstitutional. But the Nepalese traitors who are in the regime, including the Nepalese Maoists have killed the theory of constitutionalism. To extend the term after failing to draft the constitution in the stipulated time is an IMMENSE betrayal. The traitors (Congress, UMLs, and Maoists) are in an exercise in futility. There is no such thing as Morality for these culprit leaders. If the state fails to initiate action against them they will persist with extending the term for the next 5-10 years and continue to drain state coffers. The Nepali Congress and UML’s transgressors were involved in anti-nationalist activities with the support of the Maoists, and now they are bearing its result. The resignation of the Prime Minister Madhab Nepal can’t give the solution because the upcoming candidates for Prime Minister are all bad choices. The candidates are Ser Bd Deupa-NC, Ram Chandra Paudel-NC, Jhalanath-UML, Dr.Baburam Bhattarai-Maoist, Bijaya Gachhadhar and the last culprit being the daughter of Girija-Sujata Jost (a Garman Citizen). Mr. Ser Bahadur Deupa is one of the traitor-CIA agents. He is one of the corrupt men. When he was Prime Minister Deuba devised various ideas to remain in power. Deuba declared pensions for parliamentarians; increased allowances by 10 times the number then provided them with Prado and Pajero vehicles. He also led the anti-nationalist Mahakali Treaty. He provided the platform for many corrupt officials in the cabinet to drain the nation’s money. During his third time as Prime Minister after King Gyanendra took to power, the devious Prime Minister drained state money. He was not capable of doing anything in the name of the nation. Sher Bahadur is the political pendulum of congress’ politics. The period when Sher Bahadur reigned as Prime Minister is considered an extremely corrupt era. Similarly, the Congressman Ram Chandra Paudel is an agent of the Indian Embassy who called him directly. He is a traitor and a corrupt man among Congress, power hungry, visionless who would sell the country for power and money. Jalanath Khanal is also a dirty and corrupt scoundrel who deceived his party leader–Madhab Nepal PM–although, Madhab was the agent of India. It was suicidal work for him to destroy his own party. He is called the agent of Maoists who want the Prime Minister position to be under the control and support of the Maoists. He is a very useless man in the UML. Sujata Jost, the daughter of Girija, also a great antinationalist and is a dirty lady in Congress. She is also running for the support by Indians to be PM of Nepal. Her father is the cause of the present crisis in Nepal who destroyed all the identity, and unity of Nepal. Girija changed the ideology and joined hands with the Communists – where it is obvious, Communists never believe in democracy. Girija always tried his best to groom his only daughter- the corrupt anti-nationalist, Sujata Jost (Koirala) to be in the very top positions. Actually, she is very naughty and has been corrupt her whole life. In the name of her mother, she used the Susma trust to earn too much money. Using the interest, she disgraced business men by selling them credit for her own purposes. Likewise, her father, Girija Prasad with his Dhamija and Boeing scandal overturned the Royal Nepal Airlines Corporation, which was in profit to sell slums into bankruptcy. She can deceive anytime at any time. Among them, Bijaya Gachadar may be the right man for Prime Minister from Tarai but he is also corrupt like Jaya Pd Gupta and Gobindaraj Joshi and other visionless man. It is in his favor that the Maoists never support him. 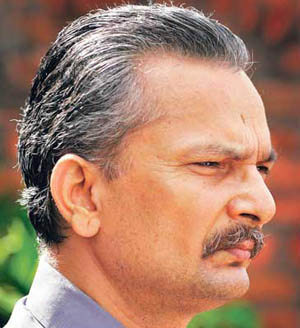 Another candidate for Prime Minister is Dr. Baburam Bhattarai who is the agent of RAW. He is the first man to destroy Nepalese Prestige and its national identities. He always challenges Nepali nationalists not to support the monarchy, Hindu Kingdom. The Daily Pioneer said “Baburam Bhattarai and his family are openly Christian, Prachanda does not proclaim his religious affiliations but his wife’s entire family is Christian. His guru,Chandra Pradesh Gajurel, was a Christian preacher.’ So, can we imagine, that democracy can be hoped for from these traitors of the various parties? ‘Each cheat the other, each need the other’. The leaders of the so-called big parties who cheat each other and busy themselves meeting each other are like those businessmen that exchange horses in the midst of a river. Nepal’s situation corresponds to one party – the communist party’s authoritarian system. Until when should we witness these dramas? UNMIN is here to intensify civil war and afterwards finish destroying the national identity by establishing a Christian state. The current consequences have resulted with the failure to chase away UNMIN ad UN human rights activists in time. They are bent on violating the Nepalese mother by extending their terms. They are all traitors, scoundrels and criminals. The leaders and 601 CA members – the transgressors that have destroyed the nation – after their actions in 2006 should have been subjected to a minimum of a 5 year ban from any political, social or economic transaction. We do not need transgressors that have destroyed the nation. We cannot allow the Nation to be sold. The Nepalese people will not let these criminals go unpunished. It is a situation where patriots will submit their lives for the nation. I repeat that the CA, cabinet and everything after 24 April 2006 have failed and should be abolished. An all sector cabinet should be formed in the presence of the king (the alternative force) in accordance to the declaration made by him in line with 1990 Constitution on 20 April 2006 – that was made through an understanding with the national and international community. There are only two likely alternatives: for safe landing of peace and establishment, being the controversial man, either the Maoist leader Prachanda will be selected as Prime Minister or another good man may be selected. There are no other alternatives. Works like this when out of Nepal easy to see but when in the middle bandha we curse them. DR babu ram ji namaskar ma tapaei ko views bata parvabit vhaya ko chhu tara ma mauobadi hoena.ma yak sadharan nepali ho aaba ma mero nepal ma shanti bhaeichara shadavhab dhekhana chahanchhu hateya hinsha hoena ra aaba ko nepal ko PM hajur lai dhekhana chhahan chhu. Heart Touching. It was not only his voice but entire Nepalis worldwide. using this web site, since I experienced to reload the web site lots of times previous to I could get it to load properly. In fact, everyone playing could say they were engaged in a psychic power contest.Those who love football cann see the matches onlpine on various sports websites. of the platform, you are betting on. injto handbags and are noww being exoorted to other countries. When there is a dirt particle larger than the air hole, the particle clogs the hoe and restricts the free flowing of air. with some sort off filtering system. Dyson vacuum cleaners are bagless and have washable filters.